It took about 6 years for the tribes of Israel to conquer the Land of Canaan and to overcome the military might of the ancient Canaanites according to Joshua 14. It was at this time that Joshua divided the land among the tribes and allotted portions according to the Word of the Lord, the size of the tribe, and by casting lots. Joshua cast lots for his men in Shiloh, and he distributed the land according to the tribal divisions. The first lot came up for the tribe of Benjamin. 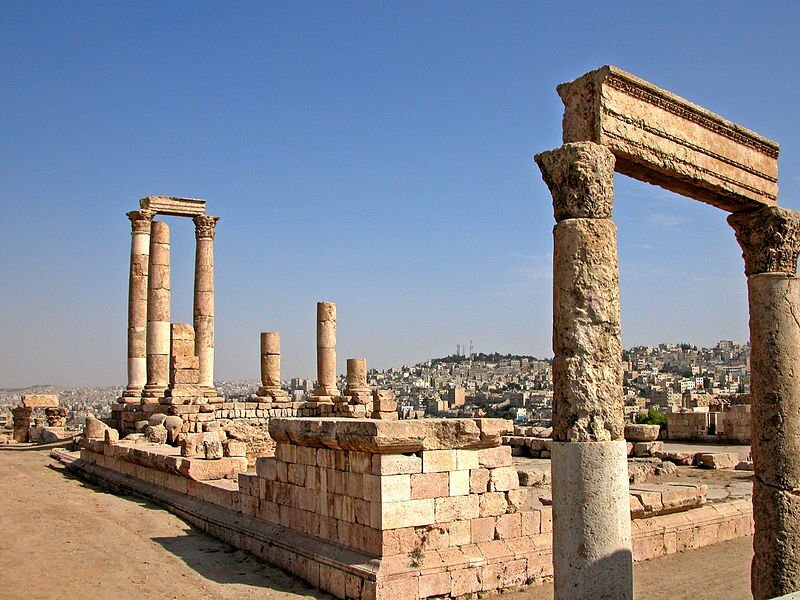 Benjamin's allotted territory lay between the tribes of Judah and Joseph. Joshua cast lots for his men in Shiloh, and he distributed the land according to the tribal divisions. The second lot came out for the tribe of Simeon. The inheritance of Simeon lay within the territory of Judah. Joshua cast lots for his men in Shiloh, and he distributed the land according to the tribal divisions. The seventh lot came out for the tribe of Dan. The allotment for Ephraim and Manasseh began at the Jordan, east of the springs of Jericho, and went up from there through the desert into the hill country of Bethel. From Bethel it crossed over to the territory of the Arkites in Ataroth, descended westward to the territory of the Japhletites as far as the region of Lower Beth Horon and on to Gezer, ending at the Mediterranean Sea. Half the tribe of Manasseh, the Reubenites and the Gadites received the inheritance that Moses had given them east of the Jordan. Joshua cast lots for his men in Shiloh, and he distributed the land according to the tribal divisions. The sixth lot came out for Naphtali. Joshua cast lots for his men in Shiloh, and he distributed the land according to the tribal divisions. The fifth lot came out for the tribe of Asher. Joshua cast lots for his men in Shiloh, and he distributed the land according to the tribal divisions. The third lot came up for Zebulun. Joshua cast lots for his men in Shiloh, and he distributed the land according to the tribal divisions. The fourth lot came out for Issachar. Hover over any red icon to open a scripture link. 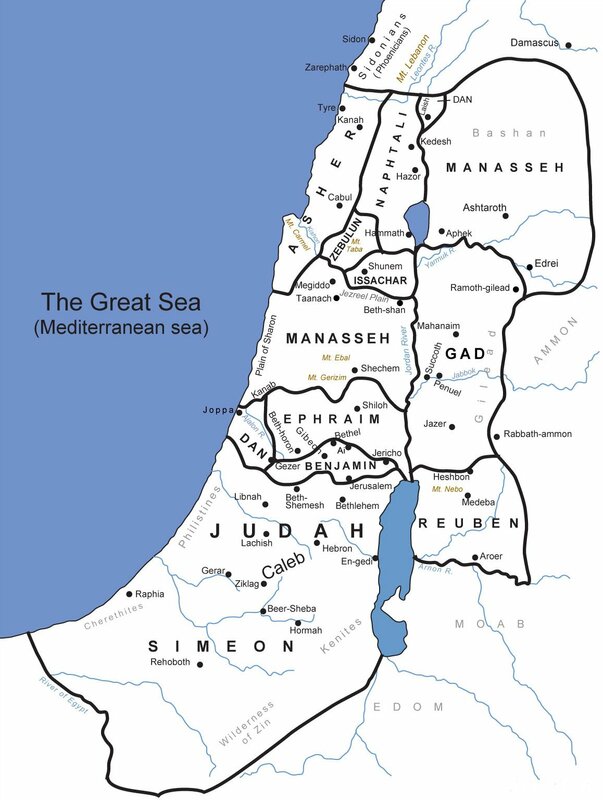 After the invasion of Canaan in c.1406BC, the conquered land was divided between the twelve tribes of Israel. The land east of the Jordan, in Gilead and Bashan, captured earlier from King Sihon and King Og (see Numbers 21:23-35) was allocated, as agreed by Moses, to the tribes of Reuben, Gad and half the tribe of Manasseh (see Numbers 32:1-19). The other nine and a half tribes drew lots to divide the land on the west bank of the River Jordan (see Joshua 14:2 & 18:1-10). The tribe of Levi was not allocated a separate territory as they were given land throughout Canaan wherever they served their fellow Israelites as priests and levites. On the other hand, the descendents of Joseph were divided into two tribes named after his eldest sons Manasseh and Ephraim. Ephraim received the lightly wooded territory in the central hill country near Shiloh (later referred to as the Forest of Ephraim), while Manasseh took over the hilly land to the north in the area around Mt Gerizim, Mt Ebal and the Vale of Shechem (see Joshua 16:1-17:18). In addition, Joshua was personally rewarded with the town of Timnath Serah in the hill country of Ephraim (see Joshua 19:49-50). Further north, land around the Vale of Jezreel was allocated to the tribe of Issachar (see Joshua 19:17-23), while the tribes of Asher, Zebulon and Napthali were granted territory stretching from the coastal foothills near Tyre to the inland basin occupied by the Lake of Kinnereth (the Sea of Galilee) (see Joshua 19:10-16 & 24-39). On the southern boundary of Canaan, the tribe of Simeon received the semi-arid foothills of the Negev Desert between Beersheba and Kadesh Barnea (see Joshua 19:1-9), while the tribe of Judah gained the hill country between Beersheba, Bethlehem and Jerusalem (see Joshua 15:1-63). In addition, the city of Hebron was allocated to Caleb in recognition of his faithfulness to God after spying out the ‘promised land’ forty years earlier (see Joshua 14:6-15). The most controversial allocations of territory were made to the tribes of Benjamin and Dan. Benjamin received land bounded on the south by the Jebusite fortress of Jebus (Jerusalem) (which remained a Canaanite stronghold for the next four hundred years until conquered by King David in 1004 BC) (see Joshua 18:11-28 & 15:63). Dan was allocated land on the coastal plain of Philistia, but was never able to wrestle this lowland territory from the Philistines. As a result, the tribe later conquered land in the far north around the city of Leshem (Laish), which was renamed Dan after it was captured (see Joshua 19:40-48 & Judges 18:1-31).